The fact that John Milton Elliott's defection from the United States during the Civil War did not negatively affect his life after the conflict shows just how common such actions were. Rather, Elliott is another politician best known for his dramatic and tragic end. Elliott was born in Scott County, Virginia in May 1820. He moved to Morgan County (now renamed for Elliott) in Kentucky. He returned to Virginia to attend Emory and Henry College in Emory, graduating in 1841. From there, he studied law, was admitted to the bar in 1843, and began a practice in Prestonburg, Kentucky. In 1847, Elliott became a member of the state's house of representatives. Five years later, he was elected as a Democrat to the House of Representatives. He was re-elected twice and chose not to run for re-election in 1858. Upon his departure, he returned to his legal practice and again joined the state house of representatives in 1861. Elliott initially favored neutrality in the split between the Union and Confederacy after several southern states seceded, but his sympathies were clearly with the states just south of Kentucky. He occasionally purchased a slave, denounced the abolitionist movement, and was a member of Kentucky's Southern Rights party. After the close of the fall session of the house of representatives, Elliott began organizing support for the Confederacy in eastern Kentucky. The activity did not go unnoticed, and the U.S. District Court returned an indictment charging him with treason for "directly or indirectly giving aid and comfort to the enemy." In December of 1861, Elliott was one of eight members of the Kentucky General Assembly expelled for the same cause. He joined the convention at Russellville organizing the Kentucky representatives to the Confederate government, and was elected to both the First and Second Confederate Congresses. After the war, the Fourteenth Amendment barred anyone who had previously sworn an oath to the United States Constitution and joined an insurrection or rebellion against it from holding office unless there was a two-thirds vote allowing it. The provision effectively ended Elliott's political career, but he was able to return to a successful legal career. He settled in Owingsville, and later Catlettsburg. From 1868 to 1874, he served as a circuit court judge. Starting in 1876, he was a judge of the court of appeals. This line of work would effectively seal Elliott's fate. The sister of one Col. Thomas Buford had purchased a farm from a Mr. Guthrie, but managed to pay off only one of three notes. Guthrie began foreclosure proceedings against her in 1871. He won the suit, but Buford argued that the title was defective and the ruling was reversed on a technicality in the appeals court. Guthrie pressed the foreclosure and won again, meaning Buford's sister lost both her property and her $20,000 investment. In 1878, Elliott affirmed the decision after Buford again appealed. By the time the final decision was made, Buford's sister had died. He directly blamed the court for her death, and bore a grudge against both Judge Pryor, who had made the initial decision against him, and Elliott. Buford later said he bore no personal grudge against Elliott, but rather had been enraged when the judge came over after Pryor's decision and said, "Colonel, I did the best I could for you." Buford considered this to be an insincere statement. "He had given the original decision against me; he had concurred in this one and although he did not pronounce it, I had means of knowing that he was the moving spirit and engineer of it all through," Buford accused. He frequently stopped by the Capitol Hotel, where both Pryor and Elliott boarded, to shout threats up to them. At one point, the sheriff tried to serve eviction papers on Buford but quickly withdrew when he found that the farm had been heavily fortified to ward off such attempts. In March of 1879, Buford sought his revenge. His primary target was Pryor, but he said he decided against killing the judge because he had children. He would not have been able to find Pryor in any case, since he had accepted a friend's drink invitation and was not at the hotel; doubtful about Buford's proclamation that he had decided against killing him, Pryor would tell people for years afterward that the drink had saved his life. Buford went after another judge as well, but couldn't persuade him to leave his breakfast to see him. Finally, Buford found Elliott in front of the Capitol Hotel with another judge. Buford had been wandering through the town carrying a shotgun loaded with buckshot, but this did not raise any concerns. In fact, Buford was wearing his hunting gear and asked Elliott if he wanted to go snipe hunting. Elliott declined, and Buford persisted by asking Elliott to go out for a drink with him. Elliott refused this offer as well. The other judge turned away for a moment and heard a gunshot. When he turned back, he saw that Elliott had collapsed. He died soon after. Buford readily confessed that the shooting was no accident and showed no remorse, calling Elliott "the most ignominious game my gun ever killed." He added that he killed Elliott "to try my case, to show that they could not rob and assassinate with impunity." The murder itself shocked the state. Governor James B. McCreary declared that state offices would be closed at noon the day after Elliott's death as a token of respect, and ordered all state officers and clerks to attend the funeral. The New York Times wrote, "No man among all the popular elements of his district enjoyed such real and universal esteem." 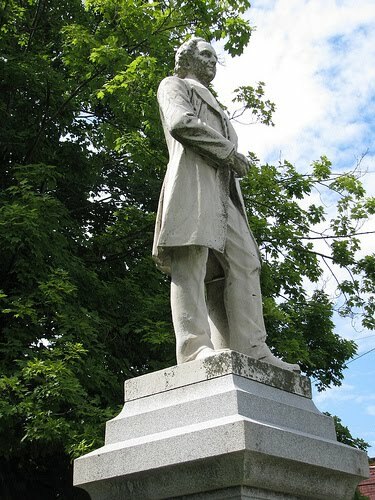 Later, Elliott would have a statue dedicated to his memory at the Boyd County Courthouse in Calettsburg. Elliott went to trial in July of 1879. There was little chance of disproving that Buford had shot Elliott, and there was no attempt to do so by the defense. Rather, 45 witnesses took the stand to testify that Elliott was insane. The jury found Buford guilty and sentenced him to life in prison. A second trial took place on appeal in 1881, and on this occasion he was found not guilty by reason of insanity. Buford was sent to an asylum, although he soon escaped and made his way to Indiana. He stayed there for two years before voluntarily returning to the asylum, dying there in February of 1885. Elliott's murder also helped contribute to the death of General Abe Buford II, Thomas's brother. Renowned as a horse breeder and veteran of the Mexican War and Civil War (on the Confederate side), Abe bankrupted himself paying for Thomas's defense. In 1884, he committed suicide, leaving behind a note that said in part, "My financial troubles have driven me to despair. Have lost my only chance to relieve my unfortunate brother and self, and the future is too dark for me to struggle against any further."